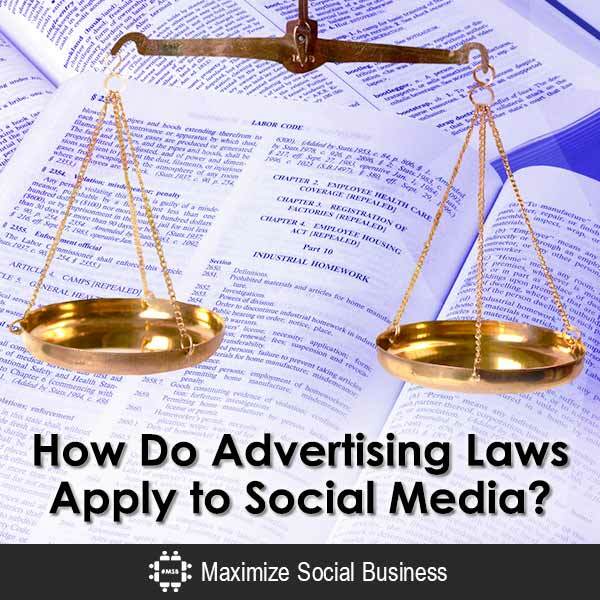 How Do Advertising Laws Apply to Social Media? Consumers spend time on Facebook than any other website on the planet. More than Google. More than Yahoo! It therefore follows that we should be engaging consumers by promoting our products and services on social media. It’s no secret that by engaging consumers through social media promotions, we can grow our social influence and reach, increase brand awareness, demand, and loyalty, and foster brand engagement. This can lead to invaluable endorsements, increased traffic to our social media site, and substantially more sales. But what laws and federal regulations apply to our social media advertising? Suppose you read a friend’s Facebook post about a new amazing product. She tells how wonderful it is and of all of its great features. Would that recommendation factor into your decision to buy the product? Probably. Now suppose you come to learn that your friend works for the company that sells the product – or has been paid to tout the product. Would that change your perception of your friend’s glowing recommendation? You bet. To help prevent misleading endorsements, the Federal Trade Commission (FTC) enforces various rules and advertising regulations over social media related endorsements and testimonials to ensure they are honest and not misleading. First, the connection between the endorser and the company must be clearly disclosed. Consumers have a right to know when someone is being compensated for endorsing someone else’s product. Second, an endorsement must reflect the honest opinion of the endorser and can’t be used to make a claim that the product’s marketer couldn’t legally make. Companies may violate this regulation by telling an endorser what to say about its products. Finally, endorsements from people who achieved exceptional or above average results must clearly state their experience with the company’s product not typical. Liability for violations of the FTC may extend to the company, marketing or advertising agency, or to the individual endorser. To avoid liability, companies and advertising agencies need to develop a social media marketing compliance program and provide social media compliance training. A social media compliance and training program will ensure that everyone understands how advertising laws and regulations apply to social media and how to prepare the proper disclosures that must be included for social media compliance. “Like our Facebook post for a chance to win. One lucky winner will be randomly selected for a grand prize.” You’ve seen these promotions. You’ve probably entered them. You may even run them for your company or clients – but are they legal? Social media contests and sweepstakes that fail to comply with the law and social media website guidelines can result in civil lawsuits, regulatory investigations, and deletion of social media accounts. To make matters more complicated, different laws apply to contests and sweepstakes. Sweepstakes are prize giveaways where the winners are chosen predominately by chance. All sweepstakes must have official rules that cannot change during the lifetime of the sweepstakes. Sweepstakes must also have clear and conspicuous statements that “no purchase is necessary” and “a purchase will not improve one’s chances of winning,” along with offering an alternate method of entry, so that everyone has an equal chance of winning even if they don’t purchase your product. Contests are promotions in which prizes are awarded primarily on the basis of skill or merit (for example, the best photograph or the winner of a trivia game). While contests always require official rules, the rules must set forth the objective, predetermined criteria for which each entry will be evaluated. There are also specific clauses that must be added about the prizes, methods and timing of entry, and other legal requirements. Contests and sweepstakes must also comply with each social media site’s promotions rules. Facebook maintains strict guidelines for their business pages and separate rules governing promotions administered on their platform. Twitter, Instagram, and YouTube also maintain their own rules for promotions. Failure to follow these promotions may result in the deletion of your social media accounts or your client’s accounts where you help administer their promotions. To avoid running afoul with social media promotions laws and site guidelines, you need to implement a Social Media Promotions Compliance Policy that will help your marketing and legal departments understand the best practices and compliance requirements of conducting social media promotions. You also need to work closely with a social media attorney to help develop your social media contest rules, prepare your social media sweepstakes terms and conditions, and provide social media compliance checklists. Are my employees posting about our products or services? Are bloggers or consumers endorsing our products and services? Are we engaging in social media promotions, contests, or sweepstakes? If the answers to any of these questions is yes, and you don’t have a Social Media Marketing Compliance Program or Social Media Promotions Policy in place, then it’s time to act fast. Each new social media post, tweet, or like could lead you one step closer to a lawsuit. An experienced social media attorney can help. And if you still have questions, never fear. Just tweet it here. I promise that your tweet most likely won’t violate any advertising laws. Ethan Wall is an expert on Social Media and the Law. Ethan is a social media law attorney, author, professor, consultant, and keynote speaker at Social Media Law and Order where he pursues his passion for educating, consulting, and training users on all areas of social media and the law. He also practices social media, Internet, and intellectual property law in Miami. He authored three books including Fire over Facebook: A Primer on Protected Social Media Activity in the Workplace and Best Practice Guide for Managing Employee Social Media Use, and the Social Media Guide for Lawyers. High profile news organizations, including CNN, NPR, and Thomson Reuters have turned to Ethan for commentaries on social media legal issues. As a consumer, I like to know that the site is trying to think of my interest not just their own. Good luck in endorsing these… unless you are a big fish no one with notice, or care!